I wanted to keep things light at the beginning of the semester, so I returned to the world of Harry Potter for the third installment in the series. Although I found the book a little slow in the beginning, HP and the Prisoner of Azkaban quickly turned out to be my favorite of the novels I have read thus far. I especially liked the themes of self-empowerment and overcoming darkness with light that pervaded the book. As the reader discovered more about the death of James Potter, we learned a little about making rash judgments right along with Harry. Perhaps the most powerful lessons were taught about assumptions through the stories of the hippogriff and Black. Both were thought to be extremely dangerous, killing machines. In the end, the truth about both the magical creature and the feared wizard came to light. There are so many other things that could be discussed…..the battle between the Patronus and the dementors……prisons that must be escaped (both literally and figuratively)……as well as ideas of discernment and true friendship. I am certain that I will return to this book again and examine the themes more closely now that I know where the story is heading. Prisoner of Azkaban has definitely made an impact on my reading life….and I highly recommend it to anyone looking for an entertaining read. When Harry Potter made his way to American bookshelves in 1998, I was a graduate student who had just started working with the children’s ministry of a local church. In that position, I felt the need to read the controversial book in order to have an opinion to share with children and their parents. As I read, I was looking for problems…..and found some things that I thought parents should know before making their own decision about the book. In my search for information, however, I missed the story and excitement of Rowling’s characters. Almost 17 years have passed since the novel made its American debut and I have found myself wondering what all the hype was about, so I decided to read the series this summer. What I found was a charming book filled with moral dilemmas, images of pure love, and the challenges of finding your own identify during childhood. Additionally, I only found a few scenes that I found questionable for pre-teen readers (the target audience of the book). Instead, what I discovered is that I was enthralled by the story and simply could not put the book down. I have actually had to forbid myself from returning to the library to pick up the next installment before I finish a couple of other books that are on deck. I realize that I am just beginning my journey with Harry, Hermione, and the rest of the cast at Hogwarts, but I am definitely excited to see how the story continues. I’m just glad I don’t have to wait as long as the original readers did to find out what happens in the next year of school. My favorite author is Jodi Picoult. Every year, I anticipate the release of her latest book and rush to the store on the day of its release to add it to my growing collection. When I saw that she and her daughter had written a young adult novel, I must admit that I was rather skeptical. Part of Picoult’s appeal is her willingness to tackle controversial contemporary topics while allowing her characters to grapple with the moral issues that arise as a result. I knew that many of her topics would not be considered appropriate for a young audience and I wasn’t sure how her writing would translate into the YA genre. Imagine my surprise when I was transported inside a fairy tale in which the handsome prince desperately wants to escape his life in the book. As Prince Oliver dreams of escape, his cry of help is finally heard by Delilah, a teen reader who has become obsessed with the child’s fairy tale. 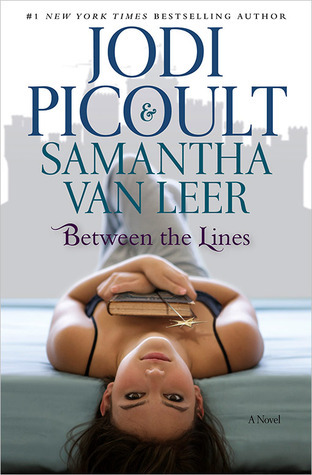 Picoult and Van Leer proceed to weave a masterful tale combining two conflicting worlds united by the growing love of Oliver and Delilah. I thoroughly enjoyed getting a look “behind the curtain” as the characters in the fairy tale lived life while the book was closed. The idea of not judging a book by its cover suddenly took on an entirely new meaning. Thematically, Between the Lines addresses pertinent contemporary issues admirably; the power of love, the impact of a parent’s death, and the search for self-identity are clearly explored in a meaningful way for teen readers. I anticipate that many junior high and high school classes will find the work a compelling story to consider along standards of the American literary canon. Until that time, Between the Lines will be a wonderful book for mothers and daughters to enjoy together that will open doors for communication between parent and child. Things were too relaxing to update my blog last week while I was on vacation. This week has been insanely busy dealing with demands that I ignored while away, so I’ve got a few novels to catch you up on. Just before heading to Biloxi, Mississippi for a few days, I decided to give in to peer pressure (primarily coming from my niece) and read the first volume of Suzanne Collin’s Hunger Games trilogy. The timing was also rather intentional as the movie was also scheduled to premiere at the end of the week. I went into my reading expecting to have a negative impression of the book. After all, the central plot is based upon a fight-to-the-death competition pitting teen against teen. Imagine my surprise when I dove into the story and discovered that the competition serves as a backdrop for a remarkable story of love, courage, strength, and moral fortitude. Rather than spoiling the work for anyone that has not read the work yet, I’ll simply say that it comes with a high recommendation from me. Additionally, I would encourage parents to read the novel themselves. While there is a sizeable amount of violence in the novel (which is thankfully not depicted graphically in the movie, garnering it an appropriate rating of PG), the deaths are treated with dignity and respect for human life from the heroine, Katniss. There are numerous opportunities for parents to dialogue with their teen regarding important issues such as peer pressure and how to respond when your moral code conflicts with a government’s demands. While I do not consider any of the characters to be a Christ figure in the novel, there are several incidents that do display characteristics beneficial to a Christian teen. All in all, I thoroughly enjoyed The Hunger Games. I look forward to reading the remaining novels in the trilogy and hope that the dignity and virtues found in book one continue throughout the series.